On the Main Serial flash package soldered on board by using our BBF Test Clip(SO8) (included). On our SMT 1.27mm Pin Header (included) soldered in place of the Main Serial flash footprint for a better stability by using the appropriate BBF cable (included). On your application 2.54mm (2X5) BBF connector (if application designed with) by using the appropriate BBF cable (included). 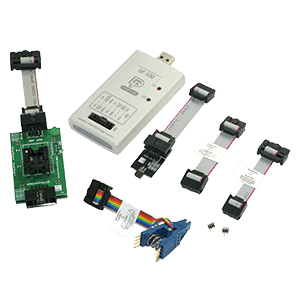 Your application will work automatically on the Backup SPI Flash inserted in our tool is SO8W socket that can be changed easily or even updated easily for new trials with our SF100 programmer (included). Our Kit is completely transparent for the application and will offer to developer high flexibility for code trials or update. The Kit is frequently used to boot failing computers and use the Flash Utility tools to update the corrupted Bios memory. Please note that the BBF modules only support 3.3V/2.5V IC. For offline programming demand only, it is recommended to use socket adaptor. Pull up resistor between Hold Pin and Vcc if serial flash on the application is not removed (schematics available under request). Email to support@dediprog.com for the schematic request. 2018 © Dediprog All rights reserved.